21 years ago, leading anti-apartheid activist Nelson Mandela was released by South African President F.W. de Klerk after spending 27 years in prison. His freedom followed the repeal of all major apartheid laws including the lifting of the ANC ban. While Nelson Mandela is probably today's most known and adored figure, little is known about the last apartheid era president who ordered his release. Frederik Willem de Klerk served as president of South Africa from September 1989 to May 1994. He is widely recognized for orchestrating the end of South Africa's racial segregation policy known as apartheid. He led the country's transformation into a multi-racial democracy that resulted in giving equal rights to all South African citizens. 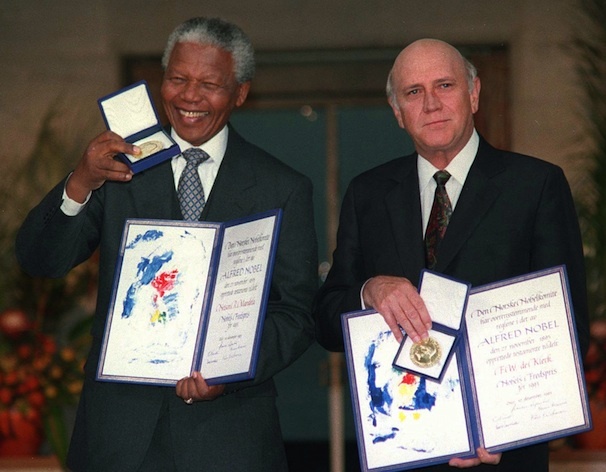 De Klerk jointly received with Nelson Mandela the 1993 Nobel Peace Prize. While many saw him as a pragmatist who was able to see the winds of change, others saw in him a skillful and passionate visionary who prevented a civil war. Recently I went to South Africa for a television series we are producing on Nobel Laureates. I had the opportunity to sit with the former president and asked him about the challenges faced by his country today, his role in ending apartheid, his relation with Mandela and much more. The following is a short excerpt of the taped interview. NR: Mr. President thank you for having us today. 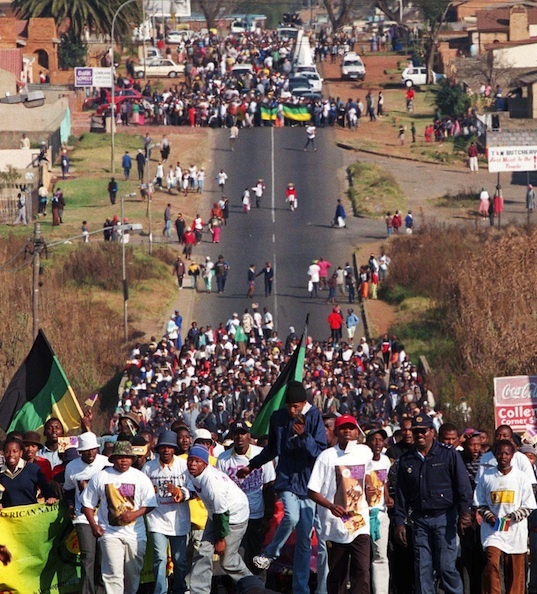 How is South Africa today, more than 15 years after the end of apartheid? Has the new country delivered on the post-racial dream? F. W. de Klerk: Fifteen years after the new dispensations started in South Africa, if one looks back, there are reasons to be positive and say we have achieved what we wanted to achieve, but there are also reasons for concern. Not everything turned out exactly as I would have liked it to turn out. On the positive side, we have a good constitution, there has been no effort to really amend the constitution and change the values and the principles contained therein and in our bill of rights. Our economy has been growing consistently except for the year of the worldwide economic crunch and again we have picked up on growth, we are talking about 3% to 5.5%, 6% growth. There is a tremendous amount of goodwill between all the people of South Africa. Only radicals in all our population groups are continuing to make wild statements, but the overwhelming majority of all South Africans, black or white or whatever their color might be, want the country to succeed. Tourism has grown - there are many positives, but we don't have a good education system, education has actually deteriorated from 1994 until now. Approximately 40% of black South Africans are unemployed. We have an unacceptably high crime rate, we have unfortunately also the scourge of AIDS and it has been mismanaged for the first I would say 12 of the past 15 years. There is also an element of threat to the constitution. The ANC party from time-to-time comes with legislation, which if accepted and if not nullified by the constitution of court, would have the effect of undermining the constitution and eroding its values. And if we deviate from this constitutional path then we run a serious risk of going the wrong way in South Africa. But by and large I am confident about the future, I am confident about our capacity to overcome the challenges which I have referred to and I am confident that South Africa will continue to fulfill its potential. It has a tremendous potential as the strongest economy in Sub-Sahara Africa. NR: What do you think was your role in ending apartheid? F. W. de Klerk: When I talk about the end of apartheid, I prefer not to claim the honor that I have ended it. The national party had already accepted by the 1980s that there was an absolute need for fundamental change and we brought together the constitutional committee. I served on it before I became president in 1989 and we struggled with the question, "how can we bring full political rights to all South Africans but in a way which would not result in a dictatorship, which would not result in a failed state", as it had happened in so many other parts in Africa. So we didn't suddenly come to the conclusion that we must change: it was a process. Firstly, it led in the early '80s to a split in the National Party. The right wing broke away. It liberated those of us who remained behind to concentrate on the need for reform and on what those reforms should look like. We called then a conference of the National Party from across the country and we presented the new vision. I played an integral part in helpings formulating that new vision... that we must abandon apartheid and accept one united South Africa with equal rights for all, with all forms of discrimination to be scrapped from the statute book. A new South Africa with a strong constitution with a bill of rights, with checks and balances which could prevent the misuse of power and the suppression of any minority by any majority, however you define that minority and however you define that majority. And then I became president in '89 and I then developed an action plan which I actually announced on the 2nd of February 1990 with regard to the implementation of this new vision. If I look back, the one thing that I am proud of is that for once I as a political leader, kept every promise I made within one term of office. We achieved a new constitution; we achieved a new bill of rights, which encapsulated this vision of justice for all. NR: Do you think that if there had not been you two, president de Klerk and Nelson Mandela at the time, we would not have witnessed the end of apartheid? F. W. de Klerk: It would be arrogant of me to say I and only I in the National Party could have done it. If I had lost the election when P. W. Botha resigned as leader of the party and one of the other candidates won, they might have done it too. They were good people and competent people and I would have served gladly under any one of those who opposed me at the leadership election. What I do believe is that in settling a violent armed conflict, personalities became important and it was important that there was a Mandela and it was important that he got along with the leader of the government which was me, and likewise it was important that the main negotiators during the negotiation, Roelf Meyer from the government side and Valli Moosa from the ANC side also developed a mutual trust and a mutual respect. Those personal relationships played an important role too at difficult momentsto keep the negotiations on track. It was fortunate in looking back for South Africa and its entire people that Mandela and I found it possible to work together even though big strains developed between us from time to time. We were also political opponents. But at all times when there was possibility of the negotiation process totally derailing, we found together a way to rise above it, to take hands and to ensure that the process go forward. NR: Do you remember the first time you met Mandela? How different was he from what you had expected? F. W. de Klerk: I remember very well the first time I met Nelson Mandela. He was still a prisoner although he was not in a cell, he was living in a little house within the grounds of the Victor Verster Prison. He was brought under cover of darkness to my office in Cape Town, which later became his office. When I met him he was taller than I expected. I was impressed by how straight he stood and by an aura of what I would call almost nobility around him. I was also impressed by the rationality of his discussion with me. I found him to be a good listener, both of us were trained as lawyers and practiced as lawyers and maybe that helped us to get along with each other. As a lawyer you have learn to listen to the other side before you make a judgment and although we didn't discuss in that meeting anything really of substance we were just testing each other. Both of us afterwards could say, 'I have met this man' and we wrote that in our respective autobiographies, 'I think I can do business with him'. NR: How did this relationship evolve? In your biography you talk about how there were moments where you felt he was very bitter towards you? As a whole, were you not surprised after all these years behind bars by the lack of bitterness he displayed towards you and whites in general? F.W.de Klerk: Yes, well talking further about Nelson Mandela let me say that the tensions which arose between us mainly related to ongoing violence, political violence within South Africa of which I later found proof that elements in the security forces were guilty, but also against Mandela's elements in the ANC that were also busy fomenting violence, Black-on-Black violence, especially in the province of KwaZulu-Nata. Cold blooded assassination against members of the Inkatha Freedom Party was carried out by ANC elements. So this ongoing violence brought people to accuse me publicly as if I knew about it or as if I was not doing anything about it, which was not the case. That made me feel not only hurt, it also made me upset at times. So those tensions at stages actually impacted negatively on the negotiation process but we always found it possible when there was a real crisis to rise above it, to push that aside and to move forward. NR: We often speak about what the end of apartheid brought to black South Africans but in hindsight what do you think it brought to white South Africans? We never talk about that achievement in terms of what the whites gained? NR:"Truth and Reconciliation" was widely regarded as a success but what's your take on it? F. W. de Klerk: I supported the legislation through the Reconciliation Commission while I was in the government of National Unity, as one of the two Executive Deputy Presidents. We worked with the team of the Reconciliation Commission. It did good work in many fields, especially the amnesty issue in finding the facts on a number of atrocities, in bringing peace to those who lost family and friends during the years of violent conflict. Where they failed was to view these issues in an even and a fair manner. They concentrated for all practical purposes mostly on the wrongs done by the security forces but failed to investigate Black on Black violence and to fully disclose the role which underground activities of the ANC played in the commission of gross violations of human rights. They failed to get to the bottom of the 400 Inkatha Freedom leaders who were assassinated in cold blood....The net gain of the process of the TRC was to gain reconciliation. The most important failure was that their activities did not really result in a jump in the direction of more reconciliation and there was more of a tendency of opening old wounds. But can I qualify that by saying that in certain personal instances it did achieve reconciliation. There were instances which brought tears to one's eyes. Where for instance a murderer confessed to the murder and where the widow or the child of the person who was killed embraced the murderer and said "I forgive you". We had scenes like that. But as a general pattern the overwhelming percentage of Whites in South Africa irrespective of their political conviction feel that they have not been fairly treated and that there was an element of prejudice in how the TRC operated. NR: How did the US sanctions help precipitate the end of apartheid? F. W. de Klerk: Sanctions kept us on our toes, it made us realize that we were drifting into a situation of growing isolation so I wouldn't go as far as to say sanctions didn't play a role but if I were to put on a scale, the issues of conscience played a much greater role than the sanctions. We could have withstood sanctions for many more years. We became experts in circumventing sanctions... So sanctions played a role but it wasn't the major role. NR: You said in a previous interview that the fight against the ANC was not to keep apartheid in place, but mostly to fight communism. Can you develop that thought? F. W. de Klerk: Well I think that, I think it would be an over-simplification to say it was not about keeping apartheid in place but only because of communism. We wanted to negotiate from the early '80s with these leaders. The ANC refused to come to the negotiation table for reasons that had good basis and some of them did not have a good basis. The fact is that until the Berlin Wall came down, the ANC was funded with money from the USSR, they received training in the USSR, they were and they still are today in alliance with the South African communist party. The fact is that at the same time thousands and thousands of Cuban troops were in Angola and Mozambique. We were fighting a war there in which MIGs from Russia were flying against our Air force, flown by Russian pilots. So the fact of a communist strategy to use the ANC to get a grip in the whole of Southern Africa, to get a grip on South Africa and its mineral resources and its strategic position was not something of our imagination. It was a hard political reality. NR: Do you now understand more why the ANC wanted to get help from communist regimes? And how much of that perceived threat delayed your goodwill into moving forward to end apartheid? F.W de Klerk: Yes I can understand why the ANC looked for support elsewhere but may I say that the fact that they were in close alliance with a world power, the USSR which had a strategy to get direct or indirect control over the whole of Southern Africa delayed for many years the possibility of meaningful negotiations. It helped me when the Berlin Wall came down, when the USSR imploded, it created the window of opportunity for me to take initiatives which otherwise I could not have taken; I could not have unbanned the military wing of the ANC and allowed them to come back into South Africa with the USSR and its expansionist policy behind them. We could have saved many lives had we reached an earlier accommodation, if negotiations had started earlier and there is no question in my mind that the whole role played by the USSR and the ANC's links with the USSR and China to a certain extent delayed a negotiated solution. NR: A last question. What has been the focus of your life since you left South Africa's politics? F.W. de Klerk: Since my retirement from political life in 1997 I have devoted my life to the establishment and development of the F.W. de Klerk Foundation in South Africa, which upholds South Africa's constitutional accord and promotes harmonious relations in multicultural societies; and the Global Leadership Foundation, which enables a panel of 28 former Presidents, Prime Ministers and statesmen to provide discreet assistance to national leaders who are wrestling with development and governance challenges. NR: Mr. President, thank you very much for your time.